On the dawn of March 18, 2019, NASSCOM DeepTech Club hosted its largest ever meet-up and Industry/ enterprise connect sessions in Bangalore. 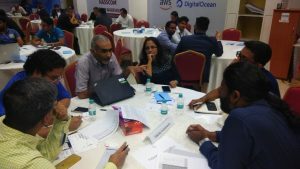 It received an unprecedented response with over 250 meetings taking place along with one round-table and was hosted in the NASSCOM 10000 Startups Warehouse facility at Diamond District, Domlur. This meetup was a part of the 4-month long mentorship program for highly curated deep tech industry product companies from NASSCOM Deeptech Club’s second cohort. This cohort will be concluded towards the end of April 2019. The meetup round table was conducted halfway in the program and was aimed at on connecting mentees and mentors to assess the cohort progress and program impact. To ensure a good mix of inputs, companies from DTC Batch 1 & Batch 2, along with Emerge50 were invited for the round table. Another key support areas identified by startups and addressed during the meetup included connecting with prospective enterprise clients and investors to get feedback on the product, explore business and funding opportunities and synergies of collaborations. These meetups were conducted in two cities – Gurugram (12 March) and Bengaluru (18 March). 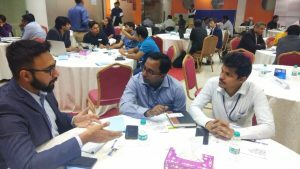 Startups were provided with an option to attend either one or both meetups as the geographical presence was a challenge for enterprises and investors as well. This way interested companies could leverage networking in both locations. DTC team roped in NASSCOM Industry Partnership Program (NIPP), India’s largest industry-backed corporate innovation program. We also leveraged our network of NASSCOM Product Council and DTC mentors. Update about the Gurugram meetup is available here. After a month of preparations at Bengaluru, in a matter of time, we have got an overwhelming response from corporate and investors – confirmations from 16 investor firms and 21 enterprises across sectors. Seeing such a response, we increased the magnitude by extending the networking session to NASSCOM Emerge 50 award winners. Idea was to leverage this opportunity of bringing the ecosystem together to the maximum. A great presence of NASSCOM leadership boosted the morale of present companies and DTC team as well. Meetup started with a roundtable discussion among DeepTech Club Mentees from both cohorts, mentors co-chaired by KS Viswanathan (fondly known as KSV, VP – NASSCOM), Krishnakumar Natarajan (Also known as KK, Cofounder, Mindtree; member of NASSCOM Chairmen’s Council and Chief Mentor, NASSCOM Product Council) and Atul Batra (CTO, Manthan Systems and Chair NASSCOM Product Council). KSV started the session with a welcome note talking through the journey of product initiatives of NASSCOM, including our international outreach. Vikram Gulecha of OCEO Waters shared his experience of being part of the MassChallenge accelerator program in Israel. NASSCOM has signed up the partnership with MassChallenge Israel to include Indian startups in their cohort. KK in his note to participants shares how NASSCOM has grown over a period with industry. KK emphasized on NASSCOM’s focused on products and startups ecosystem and how NASSCOM leadership is committed to this futuristic industry. Atul briefed the audience about various program and initiative focused on product and startups, what he calls is NASSCOM bouquet. He also urged startups to leverage the ecosystem build within NASSCOM. Vinod Sood (MD – Hughes Systique and mentor at DTC) urged all the mentee companies to do not shy away in seeking help from mentors. He asked all come upfront ask for as much as you can. A couple of entrepreneurs asked if the DTC program may be for longer than 4 months. To which DTC team responded that the mentoring program has to be time-bound and that too, short time. Because at this stage of business they have to be lean and agile. If startups can’t move the thing in a short span, they will struggle in the long run as well. We also suggested that mentee-mentors may choose to work together for longer highlighting some of the examples from cohort 1 where some of the mentees are still in touch with their respective mentors. Feedback from cohort 1 of having technology related subject matter experts was addressed by introducing them to the concept of including horizontal mentors besides lead mentor from cohort 2, wherein an additional expert can be roped in for specific needs. Roundtables ran for an hour and a half and a half with many ideas flowing in, like organizing workshops on topics of sales, marketing, go-to-markets from startups points of view. Participants were made aware of many webinar series that product council run and were informed of upcoming workshops. Roundtable was followed by enterprises connect, where 21 enterprises met 20+ startups in 1:1 meetings. More than 200 such meetings happened over the course of 2 and a half hours. And then investors connect saw 15 investors meeting these startups for the next 2 hours. We got very enthusiastic feedback for the session. Startups said their time could not have been better spent than this. Some of them mentioned of getting 2-3 qualified leads from DTC meetup. It is very encouraging for DTC team and we are looking a concluding meetup of cohort 2 in the following month with larger participation.